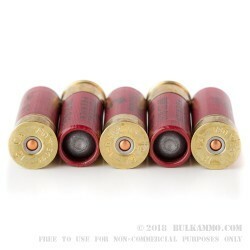 Shotgun slugs are favored for use in areas where rifle bullets risk traveling into populated areas, or areas which otherwise wouldn’t do well with rifle bullets flying through them. 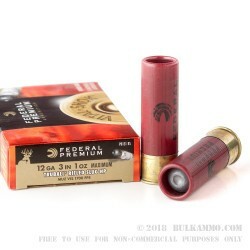 This shell is ideal for use in such environments and offers a one ounce rifled hollow point slug, an adequate projectile for hunting medium game as rugged as deer. Federal Premium bills their TruBall as the most consistent smoothbore slug on the market, capable of grouping as tightly as 1.4” at 50 yards. The technology behind this shell substantiates that claim, as the TruBall system features a plastic ball between the wad and slug that keeps the components together upon firing, centering and pushing the rifled slug out of the barrel. The components then separate cleanly upon exiting the muzzle at a velocity of 1,700 fps, ensuring performance and accuracy competitive with Sabot slugs designed for rifled shotguns.